WELCOME to The Bridge Site! Our goal is to build a regional bike and pedestrian trail network on LI, and to preserve forests, open space, existing infrastructure and historic sites along the proposed routes. We hope to improve the planning process so the costs of these improvements can be lowered. The proposed network could connect our parks, beaches, preserves, communities, employment centers and other public spaces so that Long Islanders can enjoy the outdoors without being forced to use cars or compete with traffic and fumes. This site now focuses on rebuilding the footbridge over Commack Road about 1 mile south of the LIE, and developing a trail running east and west of the area. We also would like to collect ANY historic data about this forgotton structure, if you have any photos of when it was in use that would be awesome! It was only used for a few years as a service road to access either some long gone Pilgrim leased farmland west of Commack road, or as access to some long-gone sand mines and was closed off by 1960. Suffolk County has completed work on improvements and widening for Commack Road, funded with federal stimulus money, south of the Pilgrim Psychiatric Center entrance that has eliminated the old bridge. While other parts of the USA are building massive bike and pedstrian facilities, we have made only a little progress. THE BRIDGE IS GONE! WE LOST THE BATTLE! In late June 2009 the DPW took down the old bridge since they could not separate the lanes safely any other way. But all is not lost. A new bridge should begin to rise in 2018 at the very latest. This will allow links to the future Sagtikos Bikeway to the beaches and westward to Bethpage State Park via Otsego Park too. We will not relent until it is rebuilt. Sadly, we have lost the last surface structure of the former Edgewood hospital complex, which itself is still missed by many of us. Just as we still expect to see the towering building 102 looming on the horizon when we get near Deer Park, we always expect to see the bridge as we drive down Commack... and it looks weird without it being there. We thought we had it saved and will now have to fight to get a new one constructed at the same location, one that is higher above the road and has abutments spaced far enough apart to support a wider road underneath. 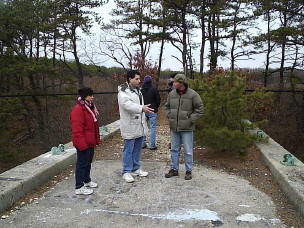 We had successfully applied for TEP funding to fix the old bridge at a cost of only $100,000, which hopefully can still be used to build a trail along the east side of Commack road heading north from the new bridge, to the north end of Old Commack Road or maybe even the Pilgrim entrance road. The county has provided some funds in the 2010 capital budget for a replacement bridge. We fully expect this will become not only reality, but the new bridge could also become the pilot project, the model of efficiency that can then be emulated wherever we need to cross a major busy road or highway along the LI Motor Parkway trail network. This trail section was one that many people already use today, and could have thousands of daily users once the trail would be built to Nassau. That trail is still alive and progressing nicely... in Nassau County... Bikes and pedestrians are still often thought of as pesky nuisances here. We want to see the regional trail, Corridor 16, get built in our lifetime. Removing the bridge could still be a MAJOR setback if the new one get delayed indefintely. We would like to also like you to know that Legislators Stern and D'Amaro have been so helpful and continue to work with us on a real solution. We know that the county executive realizes that bicycles and pedestrians belong too. Next up is trying to get some funding allocated to the Western suffolk portion of the DOT corridor 16 project and for the Sagtikos to Shorefront Trail. Be sure to check put the expanded mountain bicycle trail network at the Edgewood Preserve soon... it's a great workout for all, plus you can use these trails for running and hiking too. There HAD been some good news about the bridge for quite some time. Suffolk County sent an engineer to inspect it and it was indeed STRUCTURALLY SOUND! This alone however meant nothing much in our efforts to preserve it. Legislator Steven Stern has helped guide us through the TEP program application and pushed for county approval. His efforts have led to success... the funding was approved and the project. But SCDPW was NOT with us on this goal for technical reasons. We also have the support of Heartland for this and the regional trail concept. Heartland has told us they will not seek access to Commack road and we would like to thank them for their support and concern. The regional trail (and possibly the preserve itself) may be doomed if we do not replace the bridge! We must keep the project moving forward! They will have the funds in 2010 to begin work on a replacement. They have been great to work with and we hope to continue the dialogue. We would like to move ahead with looking at various backup funding sources for this vital project. We also would like to ask that everyone support regional bike trails in this area and write to NYDOT to support the trail network along the Sagtikos Parkway running up and down to the shorefronts. You already have these great trails in Nassau county, so it's time we build some here in Suffolk too! Nassau just applied for funding to bring the LI Motor Parkway trail east from Bethpage State Park to the Suffolk County line! We believe this 2.2 mile addition will be completed by 2018 too, so it is never too early to begin planning the connector to Otsego, by following the defunct parkway right of way, then the LIPA corridor which takes you within a few blocks of Otsego Park. Then it's just a few painted lines on a local street to finish it up. Other trails or bike lanes intersecting with the old bridge could be added later as part of road improvement projects, and enhance the area by providing a safe crossing alternative for bicyclists, walkers, and runners to use the excellent facilities at the Edgewood preserve without using a motor vehicle to get there. Reusing the existing Old Commack Road within the preserve as part of a trail system is possible since we already have had the potholes repaired... A BIG thanks to Babylon, Huntington, and DEC! ), and most of the old concrete road surface is in excellent condition. Another asphalt road leads to the proposed Pilgrim redevelopment, about half of it has already been repaved east of the new power plants. 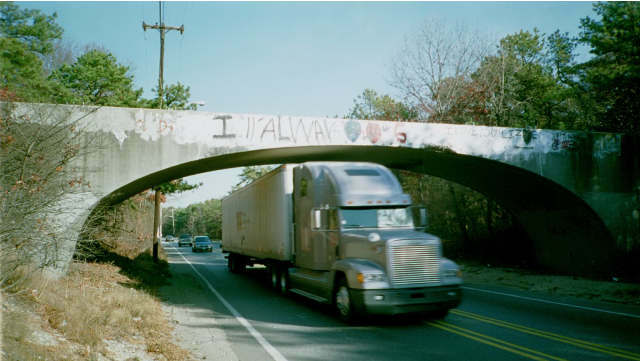 Since Huntington has proposed a large truck ban on Commack road, it would improve the local area's rideability and walkability. Also, the proposed bike lanes and trails might encourage people to ride bicycles to the overcrowded LIRR station instead of taking cars. Secure bike lockers could provided at the station. We have studied the corridor in great detail and have found a way to connect the trail over a new bridge to the proposed LI Motor Parkway Historic recreational trail proposed for Nassau County. The original alignment of the old parkway ran from Queens, through central Nassau, and crossed into Suffolk in the Melville area. Much of the original corridor still exists, and a link to this corridor along the LIPA lines that run just west of Carl's Path in Dix Hills is part of the revised plan. The initial trail project (NYDOT off-road corridor 16) is supported by the Motor Parkway Panel and LIGHT (Long Island Greenways and Healthy Trails.) For more details on the LI Motor Parkway, click on the links below! This trail system could also eventually be connected to a proposed trail that would start at the Pilgrim/Heartland complex and continue along the Sunken Meadow parkway into the park, enabling anyone to ride from Deer Park, Dix Hills, and the adjacent areas up to the north shore. Additional paths to the south shore, where the 13 mile Ocean parkway bikepath construction is now supposed to begin in 2011, are also desirable and feasible. 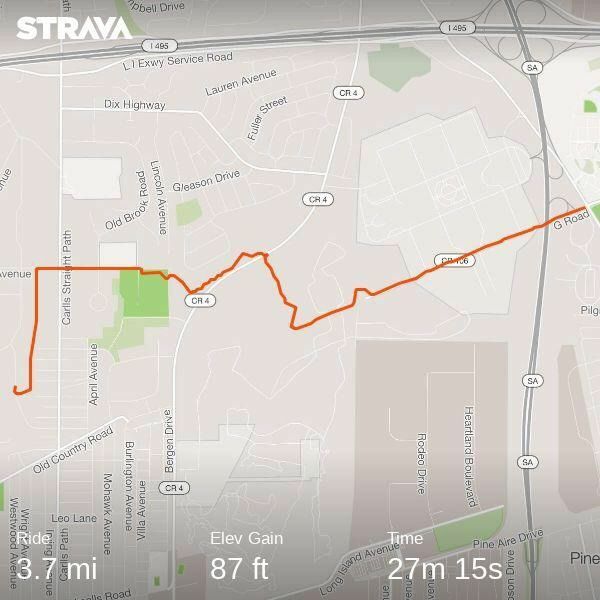 As part of the LIGHT project #1 it could head west following the LIPA right of way and connect to the proposed Motor Parkway trail as well. 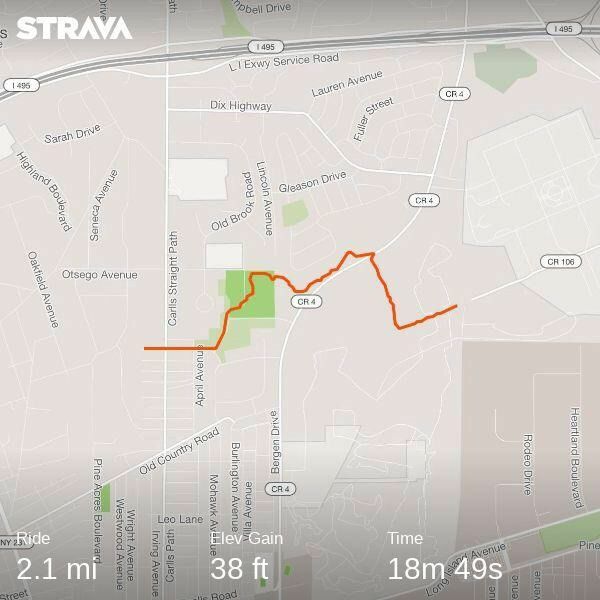 In fact LIGHT held a ride last year and proved it already possible to ride most of this route, although it is not safe or recommended due to the fact you are trespassing and several really steep and treacherous hills exist in a few areas. If people write or speak to their county, state and local officials, we WILL make it happen! It cost about $150,000 to tear down this historic structure that was built during WWII (1941). 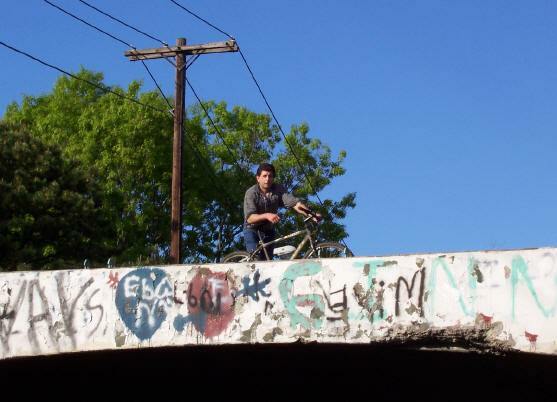 The cost of repair would likely have been about $80,000, including repairing chipped concrete and rebar, installing safety fencing, and painting over grafitti. We urge everyone to get in touch with us and get involved in efforts to replace this bridge as soon as possible, and help plan the the trails and bikepaths that will enhance the area instead of bringing in more traffic. 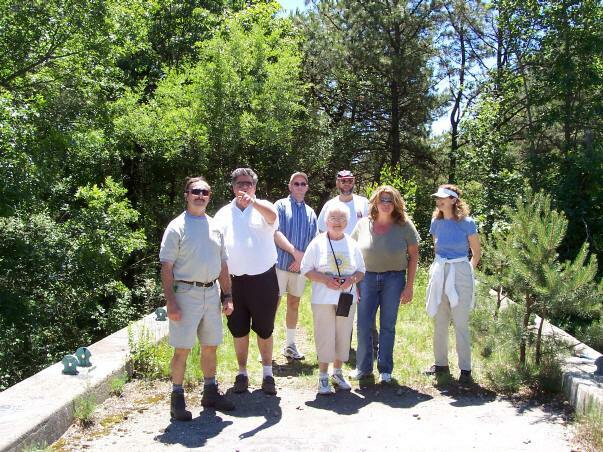 We also support preservation of any available lands adjacent to the Edgewood preserve. Much development is proposed for the area, so working with the local officials and the developers we hope to ensure that sufficient open space is protected and enjoyable facilities for walkers, bikers, hikers and bladers are part of the plans. Up to 9,000 apartments and a 15 to 18 story office tower are planned for part of the the former Pilgrim site, but the good news is that almost none of this traffic will be using Commack road. Several structures, such as the ornate water tower, powerhouse, and engineering buildings will be retained. Pilgrim will continue to operate into the forseeable future. It would be nice if local residents had a safe bike and pedestrian access route to this and other new recreational attractions, instead of being forced into their vehicles for the short ride to this complex. 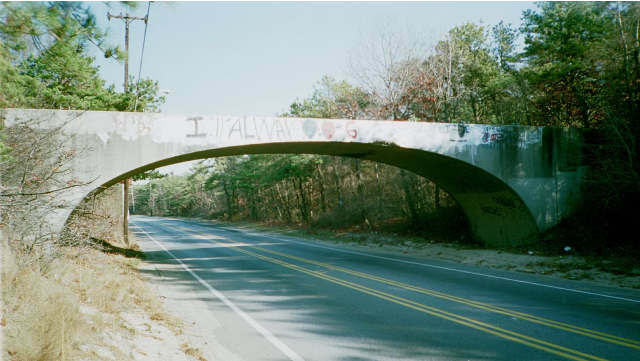 A comprehensive bike plan for western Suffolk should be created, and reconstruction of this bridge will mean there is a safe place for children, as well as adults, to cross the dangerous Commack road below. We have discussed the bridge and trail network with many local leaders and the owners of Heartland. All have agreed this is a good idea and could help to get people out of cars and onto trails, helping to clear the air and improve eveyone's health. Linking to the abandoned sections of the Motor Parkway is just the beginning: we hope to convince planners that a reconstruction of the Sagtikos should include a bike trail to the south shore... if this is done concurrently with road reconstruction the costs will be minimal. We could EASILY get a loop recreational trail that could take you to Robert Moses Beach, Cedar Beach, Gilgo, Tobay, and Jones Beach Before you head up the Wantagh Parkway and pick up the old Motor Parkway and head back to Edgewood.A list of legislative E-mail contacts has been added to the bottom of the web page. Please write or e-mail these and other officials to show your support! We WILL need your help! 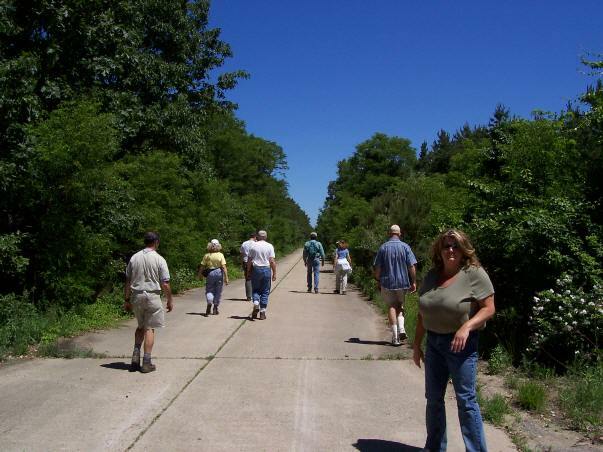 We can improve LI by creating a network of recreational trails for bicycles, walkers, joggers, rollerbladers, and any other non-motorized transportation you can think of. Please consider supporting these goals so we can avoid getting in the car just to travel a mile to the local park or strip mall. These projects include creating such trails from Belmont Lake to Babylon Village, a 13 mile trail along Ocean Parkway from Jones Beach to Captree and eventuallly Robert Moses Beach, another connecting Otsego to Edgewood Preserve via the old bridge on Commack and over to the Sunken Meadow parkway greenbelt up to the beach, an extension of the Bethpage parkway bike path to Syosset, another 13 mile route along the abandoned LIRR Wading River branch, and restoring the remaining abandoned sections of the LI Motor parkway, (AKA Vanderbilt parkway) as a recreational path running from Western Suffolk to Queens, where the bike path already exists. It's hard to get people motivated to support these projects, and there is always one local resident who fights against because of misinformation they may have heard about an increase in crime that will come with the "outsiders" coming through. However, in other areas where such trails have been built, home values INCREASED and crime decreased, it actually improved the quality of life in the area and created a park like atmosphere in these areas where it was safe for local children to play away from motor vehicles. It is much more relaxing and fun when you can go out for a ride or walk and not have to deal with traffic clogged roads, diesel fumes, inconsiderate motorists and dangerous conditions. The "Ribbon Park" open space concept is one whose time has come. Please support these plans by copying the listed proposals or submitting your own ideas via e-mail, and speaking in favor of them whenever possible. Anyone interested in supporting any of the bikepath projects should visit the The LI Motorparkway site , The Rail-Trail site, and The Edgewood Preserve site for more info and let the DOT and local leaders know of your support! The Long Island we once knew has become densely developed. Somehow, perhaps through a combination of good luck, a lack of early planning, several failed projects such as Multi-Town, and the environmental vision of NYS Senator Johnson and the Pine Barrens society, at least 850 acres of preserved wooded land remains at the Edgewood preserve. This is the last significant remnant of this ecosystem on Long Island. There is a 3 mile official hiking trail on the land, as well as at least 17 miles of marked mountain biking trails and more old fire roads. 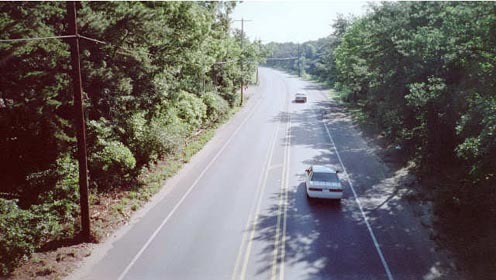 Also running north and south is the 1.6 mile concrete Old Commack Road, which is in good condition. Key among those trails is one that starts at "Old Commack Road" which is now the concrete bikepath, and heads west over the old bridge, eventually connecting to trails inside Huntington town's Otsego park. These trails heading west are known as NYDOT Corridor 16 and would lead all the way to Jones Beach among other destinations. To the east of the Edgewood preserve, another possible trail could follow the Sagtikos parkway and Robert Moses Causeway to the south shore, and north all the way north to Sunken Meadow State park. WRITE TO YOUR STATE AND LOCAL OFFICIALS! This page, the LI Motor parkway page, the LIRR rail trail page, the Edgewood page, the recent photos pages, are hosted by Denis Byrne. Thanks to all of you who have responded to the site and all of your constructive comments! Let's save the bridge and save our tax money for other needs! THANK YOU VISITING, HOPE YOU ENJOYED IT AND DO RETURN! WE NEED YOUR SUPPORT... SEND YOUR COMMENTS! THE FORMS DO NOT WORK PROPERLY SO PLEASE SEND AN E-MAIL MESSAGE STATING YOUR THOUGHTS OR INTERESTS! 14)STOP the HUGE NYS INTERMODAL FREIGHT YARD (TRIM) from being built at the PRESERVE BORDERS! MOST IMPORTANT:ADD YOUR IDEAS AND THOUGHTS TO YOUR MESSAGE! NEW! This list was added in 2002 so you can send an e-mail or write a letter to your legislator and other officials. Please take a moment to send a short note supporting this project! If it is at all possible, please write a formal letter or call the offices of the officials and let them know of your support. Many recieve hundreds of e-mails daily and they can be overlooked. Thanks!